At Looksie our vision is simple. We make property tours come to you. Want to give your clients an experience they’ll never forget? Our 3D tours use cutting-edge Matterport technology to create a dynamic and engaging virtual walk-through experience that will make your clients feel like they’re actually there. Potential buyers can virtually walk through your sellers property from anywhere, at anytime, with the device of their choosing – desktop, laptop, or mobile. 3D Dollhouse is a differentiator. It’s the closest thing to a photorealistic 3D floor plan that you can give to your prospective homebuyer. More than a photo, which offers an aesthetic sense of the space, this is a tool that enhances that visualization with an understanding of the way rooms flow, how they could accommodate furniture, and what living life might be like in the home. Property Tags are short descriptions you can associate with a room in a Space. You can use a label to highlight important features or appliances so your buyers don't miss anything. You can also use tags to provide square footage of a room at a glance, the potential uses are endless. 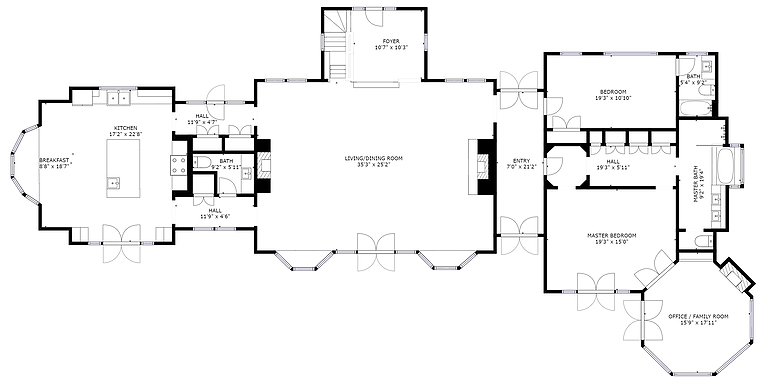 Our sophisticated 3D technology renders floor plans too! We use the laser measurements from our scan to create a 2D floor plan for your space with all measurements and dimensions. No more pencils and paper here folks! Want to give your clients the full picture? Get that perfect birds-eye view shot with our HD 4K drone technology. Our 4K drone photos and videos give you a fresh perspective on the space that’s not bound by gravity! Our Aerial videos are completely brandable! Get your domain and logo on that video! Haven’t you heard? Single property websites are the new home tour! A single property website is your one-stop-shop to market a listing. You can feature photo galleries, floor plans, construction history, property details, and of course, a 3D home tour. It keeps you in control of your listing and is the exclusive option that will blow your competitors out of the water! Don’t get left behind. Get online. Want to leave a lasting impression in your buyer’s hand? We can produce a single page brochure that your colleagues will be envious of. As the perfect add-on to your single property website, this will remind your buyer of the awesome experience they had with your listing.